We are especially thankful to Nutrien and their employees for their continuous support. An exceptional 89% of Nutrien employees donated and the corporation matched them dollar for dollar, making their total donation more than $174,000. Supervised by Ray McKeithan and the staff, department heads received training and met with local United Way agencies at luncheons to gather information on current programs. 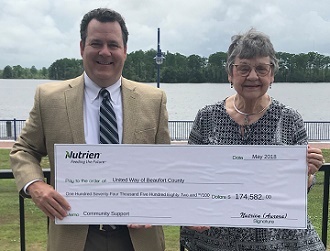 In the last 10 years, through Beaufort County United Way, Nutrien Corporation and employees have donated more than $2 million dollars to our county, making a major impact. We and our partner agencies are deeply grateful. Local workplace campaigns were held in Beaufort County Community College, BCDC, Beaufort County government, Beaufort County Schools, City of Washington, ITW Medical, Nutrien, and Vidant Beaufort Hospital. Other companies and employees that contributed include BB&T, Carver Machine Works, Domtar, Duke Energy, Nationwide, National Spinning, Piedmont Natural Gas Foundation, SECC, UPS, Walmart, Washington Noon Rotary, Wells Fargo, Frederick & Margaret L. Weyerhaeuser Foundation, F.N.B. Corporation, and Wilson, Jones & Griffin PA.